Long day today. Up for a run at 4am. At my desk by 6.30am. Flagging by 7.30am. Third cup of coffee at 7.58am. On a bit of a general whinge today. I have a mentor at work. He's a great sounding board, although sometimes I feel like I'm getting cheap (free) therapy at the same time. I assuage my guilt by ensuring he regularly receives cake. The plan for today's recipe went out of the window when I got home to find a poorly toddler. Takeaway was ordered. Dammit. I still have a recipe to make and a blog to write. And a pineapple that had been earmarked for the poorly toddler who won't eat. Leiths Simple Food seemed to be the answer. Pineapple. Check. Chilli. Check. Lime. Check. Stock syrup - two parts water to one part granulated sugar. Bought to the boil, simmered for a couple of minutes. Check. Add the chilli to the stock syrup mixture before boiling. Peel and slice the pineapple. Once the stock syrup is ready, pour over the pineapple and then grate the lime zest on top. Done. Blog - in progress (at this point of typing). Pudding. Eaten. Verdict? I think it would've been better warming the pineapple through in the syrup. Wasn't a fan of the warm syrup and cold pineapple combination. Would've been far better if it was all the same temperature. 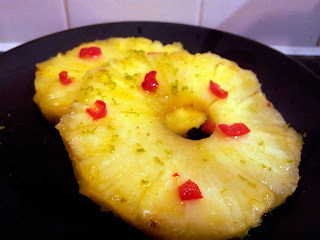 Chilli and lime with pineapple. Nice! Very tropical. Job done! See you tomorrow! PS: Picture won't upload. Will update tomorrow although it's a bit of pineapple with green and red bits - nowt to get too excited about. But I NEED SLEEP and can't wait for it to upload any longer.